The initial excitement was to soon die down as the reality sunk that Rahul Gandhi was no Rajiv Gandhi. Will, that happen in Priyanka Vadra’s case too? One waits for Priyanka Vadra to speak. Will she parrot the line the party president has taken, or will she be more positive, less malicious and less economical with the truth? Congress workers and supporters are over the moon after Priyanka Vadra’s roadshow in Lucknow on Monday. The crowd was certainly big, and the people weren’t really excited by the presence of Rahul Gandhi, Jyotiraditya Scindia and the rest who shared space with her in the open vehicle that made its way to the Congress office in Uttar Pradesh’s capital; they had come to see and hear Priyanka Vadra. They did see her but not hear her, because she did not speak. At the Congress office, it was Rahul Gandhi who took the stage and launched into his usual ‘Chowkidar is a thief’ jibe at Prime Minister Narendra Modi. We will have to wait for another occasion to hear Priyanka Vadra’s views. Priyanka Vadra will have to face questions on her husband Robert Vadra’s questionable land deals which are under the scanner now. Talking of the enthusiasm among Congressmen and women over the roadshow, they ought to be reminded that in 2017 too there had been a grand roadshow in the State, featuring Rahul Gandhi and Akhilesh Yadav, and the buzz was that the two ‘youth’ leaders would set the Gomti on fire. The two are still nursing the burns that they suffered thereafter. Interestingly, this time around, Rahul Gandhi called upon his party workers and leaders to work towards installing a Congress regime in the State after the next Assembly election. But that is still three years away. Less than three months from now is the Lok Sabha election, and the Congress president had nothing to say on that. Perhaps he realises that even Priyanka Vadra cannot work wonders in such a short span of time. Banners and posters that had come up for the Monday event emphasised that Priyanka Vadra was another “Indira Gandhi in the making’. Just as Indira Gandhi led the Congress to a triumphant comeback in 1980, so will Priyanka Vadra now. There is the only problem here: This sounds suspiciously like an acknowledgement of Rahul Gandhi’s failure. If Priyanka Gandhi is being projected as an avatar of Indira Gandhi, so had Rahul Gandhi been projected as an avatar of Rajiv Gandhi when he entered politics. The initial excitement was to soon die down as the reality sunk that Rahul Gandhi was no Rajiv Gandhi. Will, that happen in Priyanka Vadra’s case too? At least Rahul Gandhi had come with no negative baggage; he accumulated it along the way by his inept leadership. Priyanka Vadra will have to face questions on her husband Robert Vadra’s questionable land deals which are under the scanner now. The day she was having her roadshow, Robert Vadra was making his way to Rajasthan where he was to be auctioned by investigating authorities. She will defend him, no doubt. And with that, the Congress too, which until now had maintained that Robert Vadra was a private citizen, will have to defend him. How will this play out in the minds of voters, one has to see. 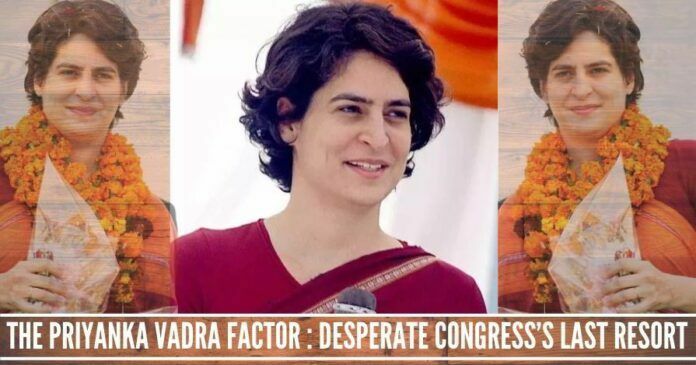 There is speculation on who the Priyanka Vadra factor will harm more, the SP-BSP combine or the BJP. This is based on the assumption that the factor is a potent one. Priyanka Vadra had been active in politics for some time now. She has over more than a decade campaigned for her mother Sonia Gandhi in Rae Bareli and brother Rahul Gandhi in Amethi for Lok Sabha elections. Arguably, the two would have still won in 2004, 2009 and 2014 even if she had not campaigned. The real question is: What happened to her charisma during the Assembly elections? If the Priyanka factor was so strong, how is it that the Congress has been nearly wiped out from the Assembly constituencies that fall under these two Lok Sabha seats? This is not to say that Priyanka Vadra will be a complete non-factor. Among the voters, she may well attract a few thousand more votes across the State. But that is not going to be enough to effectively confront either the SP-BSP or the BJP. within the Congress, she will enthuse grassroots workers, but these workers have the disadvantage of falling back on an organisation that is in a pathetic state in Uttar Pradesh. Still, one lives in hope. Ironically, Congress may need to draw comfort from its bitterest rival, the BJP, which made a dramatic comeback after being marginalised in the State for decades. Perhaps the Congress too do the same. But the BJP rode on Narendra Modi’s charisma in 2014 and a mix of many factors including the Modi factor in 2017. Those don’t exist for the Congress. Meanwhile, one waits for Priyanka Vadra to speak. Will she parrot the line the party president has taken, or will she be more positive, less malicious and less economical with the truth? MYSTERIOUS POWER WITH THE NAME ‘GANDHI’ DOES ALL ! Otherwise why nehru was chosen? and dynasty prevailed till a few years back! Only in 2014 people came out of mesmerism of ‘gandhi’ and opposition are so united that it reminds the WILD LIVE VIDEOS! This new face is apparently a BAIT but its poison too because ROBERT VADRA is attached! Voters may say if new face divorces ROBERT we may vote heras successor of a ‘gandhi’ THEN WILL SHE BE ATTACHED TO ROBERT? IN PUBLIC? (this issue came out in a gossip among fantasy lovers in a bus) who knows? are people that fool in 2019?